An eye catching new variety with red stems and deep green foliage. The flowers open white from mid June maturing to pink and burgundy red by September. Paniculata Vanille Fraise is an exceptionally pretty hybrid variety of the Hydrangeaceae family that as its name suggests originates from France. After being introduced in 2010, it has understandably become an incredibly popular deciduous shrub with gardeners especially with it being hardy and easy to grow. It produces stunning dense cones of satin white flowers turning strawberry pink as they mature from summer through to autumn. This variety of colours as new buds mature along with the deep green foliage, while red stems create an eye catching display either at the back of a border due to its size or as a stand alone shrub. Any flowers that remain in the autumn if left will create additional interest throughout the winter, alternatively some like to cut the architecturally impressive blooms, dry them and use in flower arrangements. These hydrangeas benefit most from being planted in moist but well drained sand, clay or loam soil in full sun or semi shade. 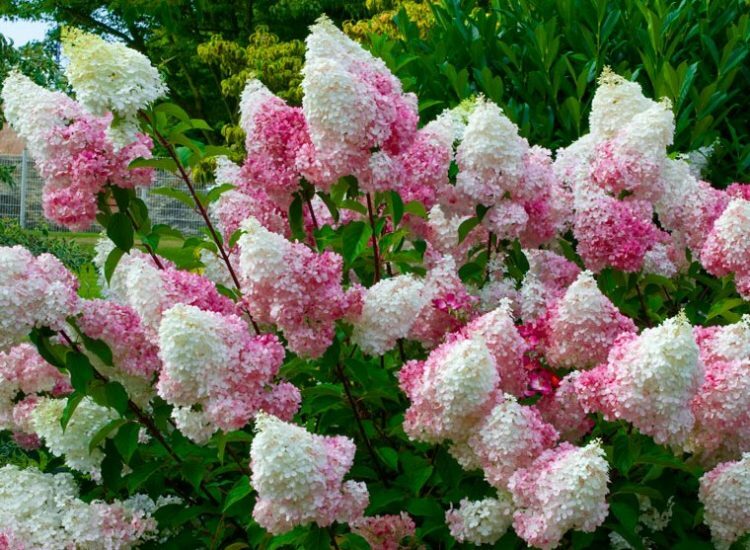 Hydrangea Paniculata Vanille Fraise can grow up to 2 metres high and 1.5 metres wide, attaining an ultimate height can take up to 5 years.. Pruning is best done in early spring once the worst of the cold weather has passed. You can trim them back by as much as one third cutting them back to just above a low pair of buds. Paniculata Vanille Fraise Hydrangeas are sold potted so can be bought throughout the year subject to availability. Please do call us if you have any further questions and we will do our best to help you.